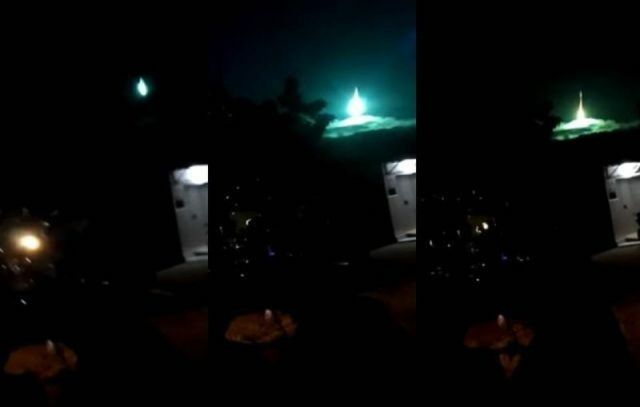 An enormous flash has been seen in the Rio Grande do Norte sky intrigued residents of several cities on Saturday night, July 7, 2018 around 10:35 pm. Residents of the cities of Mossoró, Areia Branca, Assú, Baraúna, Severiano Melo and even in Ceará cities like Icapui said they had witnessed the flash. The first information is that a ball of fire suddenly appeared upon which it changed direction before falling towards the ocean, eventually hitting the ocean. “I saw it clearly here on the beach of São Cristóvão and it lit up all the sea. It seemed to me an explosion of something in space,” reported witness Daniel Fortunato. At first glance it looks like a meteorite but since meteorites are not changing direction the question arises what it could have been that exploded over the ocean. This unexplained event comes shortly after a mysterious object splashed into the ocean off shore Washington.